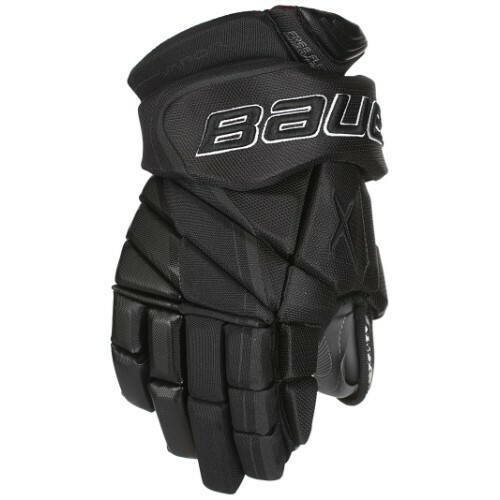 The Bauer Vapor 1X Lite Glove continues to improve Vapor's top-tier lineage with key improvements in fit, feel and protection. The 1X Lite's redesigned backroll and tighter finger gussets offer a more anatomical fit in the lower portion of the glove, while the Free Flex cuff opens up more than before for enhanced mobility. Bauer utilized their new AX Suede Quattro Grip palm with a Stretch Fit insert that provides enhanced stick feel, stick grip and abrasion-resistance. This palm and the liner are all treated with Sanitized Technology that keeps the 1X Lite smelling fresh by preventing odor-causing bacteria from ever forming. The unique treatment process directly embeds it into the fabric so it won't wash out over time. 37.5 Liner Technology is found here also, which does one of the best jobs of moisture-management on the market. 37.5 uses a player's body heat to dry the moisture instead of wicking it around like traditional materials.